Japanese match book covers… Many more at Agence Eureka. As we close the cover before striking, we might recall that it was on this date in 1890 that the Meiji Constitution went into effect in Japan, and the first Diet convened. 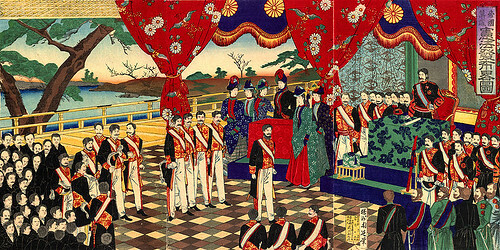 Modeled on both the Prussian and the British models, the Meiji Constitution provided for a form of mixed constitutional and absolute monarchy that lasted until 1947. In practice, the Emperor was head of state, but the Prime Minister was the actual head of government.